Montana Territory’s population was estimated at 20,000, half of whom lived in or around Virginia City, the capital. A lot was happening. The short-lived vigilante era (at least for Virginia City) was coming to an end, with the establishment of a grand jury and a court system. 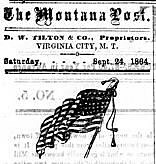 Montana’s first newspaper, the Montana Post, began publishing. Despite those early signs of civilization, Virginia City, and all of Montana Territory for that matter, was still the wild west. Gold was the currency, and those who had it were quite likely not to hold on to it long, given the gambling, highway robbery and/or women of the night. It was a dangerous place, with dangerous characters. But, it was also home to families and children. Unfortunately, some of those families lacked even the slightest attributes of decent parenting. The Montana Post lamented, “…in our city there are a number of boys from eight to ten years old…who are left to take care of themselves, ramble the streets at all hours, and employ their time as they choose, without restriction. “They drink, they smoke, and they swear; have money and spend it freely, but it remains a mystery as to where they get it,” although the Post, in a separate article, noted the probable answer to its own question: a theft of a buffalo robe by a 13-year-old. The call was answered by Thomas J. Dimsdale, a 32-year-old native of northern England, recently arrived from Canada. 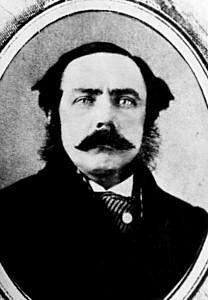 Educated at Oxford (although financially unable to complete his studies), Dimsdale had spent ten years teaching in Millbrook, Ontario, eventually being named a head master and acquiring the title of “professor,” before heading out west. Dimsdale opened a subscription school in Virginia City in late summer, 1864. The local paper was supportive, calling education “essential,” even though it might cause “some sacrifice of personal ease” to parents. Within a short time, The Post urged the community to take a larger step, making school a public affair, not private, and a burden shared equally by all citizens. Interestingly, the Montana Post-Dimsdale connection soon moved beyond editorials concerning education. The young professor actually became the paper’s editor, and (in doing so) made his mark on history. Despite no formal education in journalism, Dimsdale was prolific. In 1865, he penned a lengthy series of newspaper articles on the history of Montana’s vigilantes. His boss, D. W. Tilton (who owned both the newspaper and the local book store), compiled the articles into a book – the first book ever published in the Territory. Three years after arriving in Virginia City, he died of tuberculosis. He was just 35 years of age. NOTE: In addition to The Montana Post (1864), part of today’s article is based on a 1965 thesis, archived at the University of Montana: Goligoski, Robert John, “Thomas J. Dimsdale| Montana’s first newspaper editor” (1965). Theses, Dissertations, Professional Papers. Paper 3890.